If you?ve walked the mechanics? pits at any National or International level event, chances are you?ve seen them: trademark Stan?s black quart bottles with no labels. Look closer and you might have seen strange symbols scrawled all over the bottles in a silver marker, letters and numbers, formula notes by the man himself, Stan Koziatek. For nearly fifteen years Stan has been quietly formulating a special racing version of our legendary sealant for many of cycling?s most successful teams. Working with athletes who push themselves and their tubeless systems to the absolute limit, we?ve developed a proprietary sealant formula with close to twice the amount of our standard sealing crystals plus our special ??XL?? crystals capable of sealing even larger punctures. 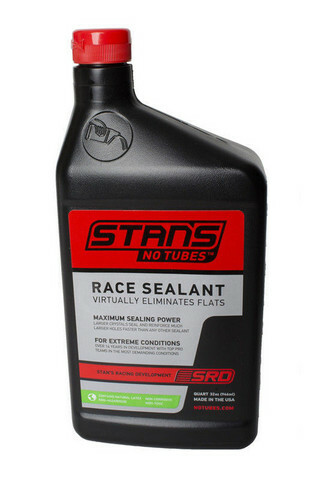 Stan?s Race Sealant?s combination of large and smaller sealing crystals interlock to form a lattice work that not only seals but strengthens and reinforces the area of the puncture, allowing for an entirely new level of sealing performance. The quantity and size of crystals in this special formula means that Stan?s Race Sealant can only be installed directly into the tire. As a result of its immense sealing capabilities, the Race Sealant will clog injectors and smaller bottles almost immediately. We are now making our Race Sealant available to riders everywhere. Stan?s Race Sealant is only available by the quart. Will clog all valves and injectors instantly?